I was craving a bit of Peruvian cuisine, feeling nostalgic after my trip to Peru a few months back. 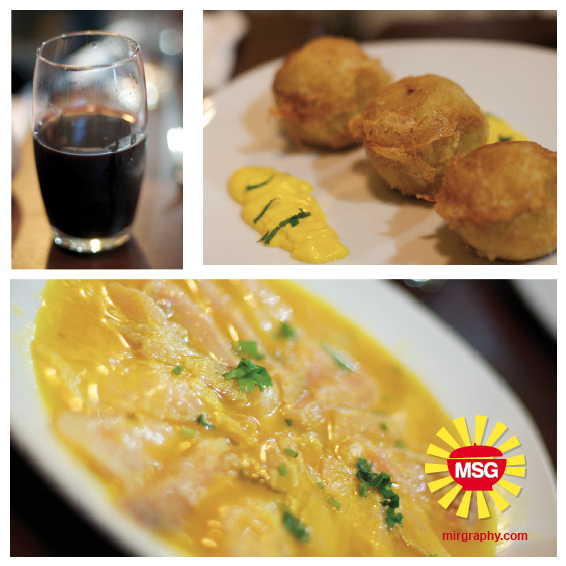 I was really excited when I heard of the Peruvian restaurant Misky Cravings from Grab Your Fork‘s review in Timeout. 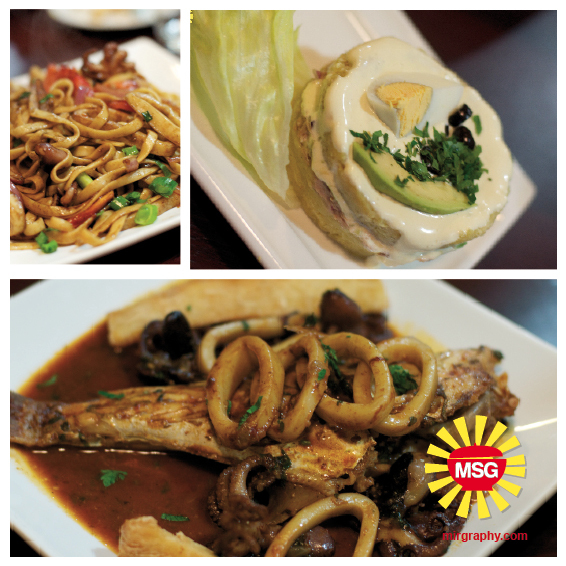 The word Misky means delicious or yum in Quechua (the ancient language of the Andean people), highly appropriate for this little gem run by husband and wife team Julio and Carmita Ruiz in the middle of Fairfield. It opened last July, but the words has already got around that this is the Peruvian restaurant to go to. Popular with the local Peruvian community, the restaurant is great reason to venture out into the suburbs. A hint when you are trying to find the restaurant, it’s actually in a little alley between a florist and a chemist. They do have signage, but you have to poke your head in or risky wandering around for half an hour. First up, while waiting for others to show up is the Yuquitas ala huancayna – deep fried cassava topped with a slightly spicy and delicate cheese sauce and a hint of yellow chilli. 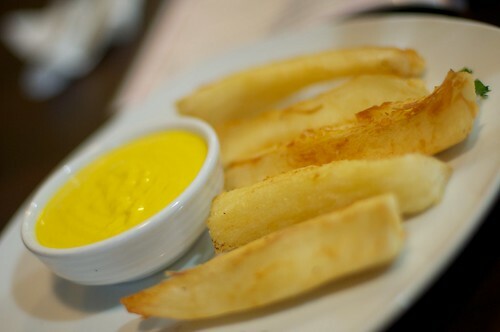 Think a more starchy version of wedges. Tuna topped with a tangy seafood and mayonnaise. This is actually a combination of the seafood plate above and the three plates of ball shaped deep fried dough below. A number of MSGers are allergic to prawns, so we had to order prawns on the side. Eaten separately, they were good, together the creamy seafood sauce is great with the tuna balls. For drinks we ordered a jug of Chica Morada – unfermented chicha made from purple maize which is then boiled. It can drunk hot or cold, but has a distinct bubble gum flavour which depending on your palate might be a little too sweet or refreshing. If you’re after ceviche we ordered two, the first (see above) Tiradito A type of ceviche with a twist of Asian influence; slices of fish marinated in lime ginger, garlic and chilli paste. 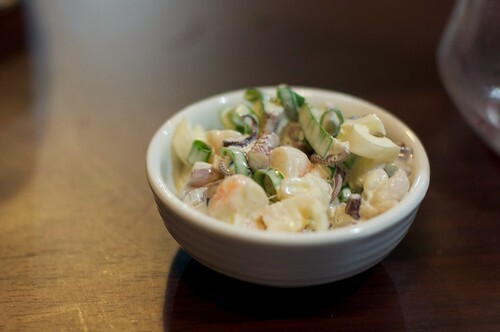 The second and what I would recommend is the Leche de tigre –An aphrodisiac hang over cure; spiced up blended ceviche (photo below, left hand side). It’s refreshing with a lime and spanish onion kick and thanks to the chef who gave us a complimentary serving, this is what I would come back for. 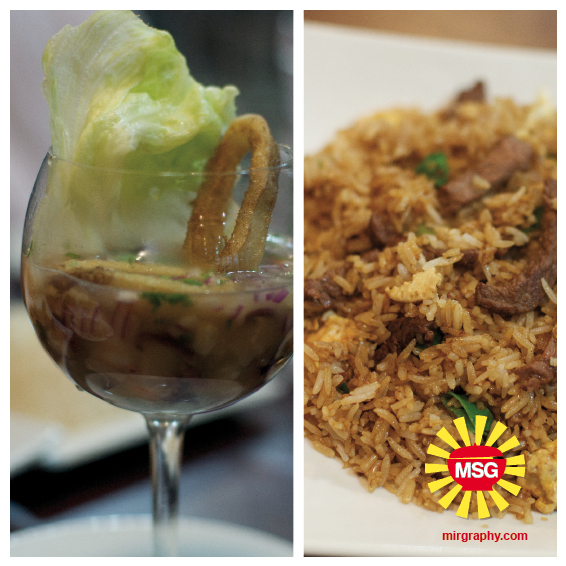 Both dishes can be found in most Chinese restaurant anywhere in the world. Thanks to the Chinese immigrants in Peru this tradition of the East can be seen in the number of Chifa (Chinese restaurants around Peru). 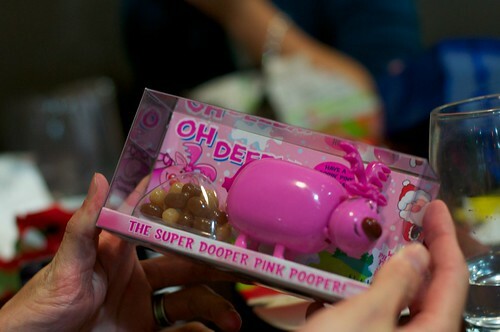 I first had this during the Inca trail out of all places. Our amazing chef managed to whip up this dish in the middle of the mountains. It sounds like a strange mix, but think of all the best quality of mash potato, it’s creaminess add a dash of spice and somehow the texture is an amazing companion for the tuna underneath. Try it, you’ll get it. As it was the last MSG for the year (two years running now! We swapped out Kris Kringles before finishing up with dessert. My vote is to finish with the Picarones – Light and crispy doughnut like Peruvian delicatessen served with “rock sugar ” syrup. ← Happy Lunar New Year…dragon style! The food was good. The Chinese influence unexpected. Cetainly my favourite was the Chica Morada. I know what you mean maybe invigorating would have been a better choice of word.